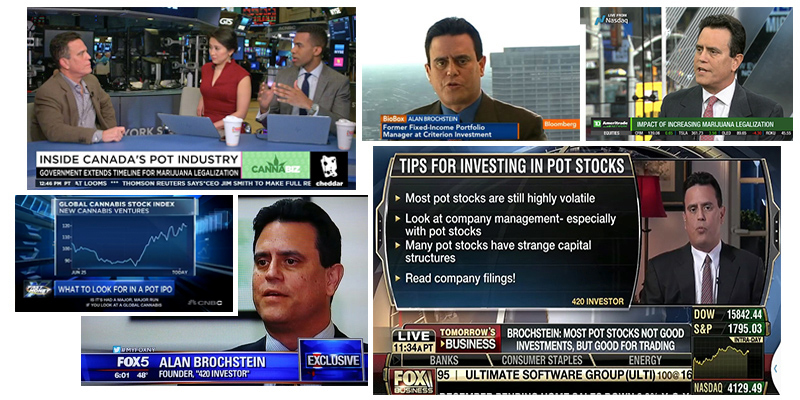 Before Alan Brochstein became the leading “Cannabis Financial Analyst” in the marijuana industry, he spent decades on the inside of the investment industry as a portfolio manager. To learn more about Alan, New Cannabis Ventures, or 420 Investor, visit the company overview page. For speaking engagements, interview requests or general inquiries email us. the rapidly evolving legal and medical cannabis industry. Read Alan’s Exclusive Stories and Breaking News on New Cannabis Ventures. Planet MicroCap – 02/05/19 – Ep. 82 – Investing in Cannabis 2019: Where are we now? Midas Letter Live – 10/18/18 – Is A Seismic Shift Towards U.S. Cannabis Stocks Brewing? Vice Money – 08/02/18 – Should You Buy Pot Stocks Before or After Legalization? Leafly – 05/14/18 – You Can Invest in a Cannabis Mutual Fund—But Should You? Cannabis Investing: Does Revenue Even Matter? Legalized pot – get in now, or wait? MassRoots And CannaRegs: Does The $12 Million Acquisition Make Sense? The Haymaker: Are Cannabis Stocks Finally Growing Up? Public Marijuana Companies Using Stock To Make Acquisitions: What Does This Trend Mean For Investors? Why The Canadian Marijuana Market Is Blooming Amid Uncertainty In The U.S.
HighQ: What are the best marijuana stocks to invest in? Marijuana Legalization And A Republican Government: What Does It Mean For The Pot Industry? Marijuana Ruling: Is The DEA Re-Scheduling Bullish For Weed Stocks? Did Walgreens just flip the script on a pharmacy’s medical marijuana stance? CBD Setback in Florida, Progress for Marijuana Research & Cannabis Stock Slump? Why Is Nobody Investing in New York’s Brand-New Medical-Weed Industry? Buying Legal-Marijuana Stocks: Just Say No? Are high returns from Marijuana companies just a pipe dream?